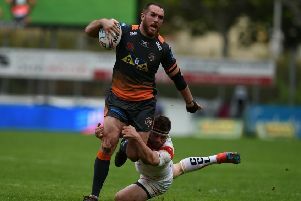 New back rower Joe Wardle has been impressed by what he has seen so far at Castleford Tigers and believes he has joined a club set fair to continue to be successful. The 26-year-old former Huddersfield Giants man has joined the Tigers after a season in the NRL with Australian club Newcastle Knights and feels his new club can win major silverware in 2018. A powerful runner and noted aggressive defender, Wardle is the most high profile addition to a Cas squad that finished 10 points clear at the top of the Betfred Super League last year before missing out in the Grand Final. Wardle saw at first-hand how much that hurt after being around the squad at the back end of last season, but reckons the Tigers are well placed to step up again in 2018. He said: “I came in a little bit at the end of last year, towards the Grand Final, just to get used to how the guys do stuff. “I didn’t really train much, just showed my face around the place and I was really impressed then. “Things have really kicked on since the start of pre-season, all the boys have really knuckled down and we have trained hard. “We are really keen to go one step ahead this year. The boys were disappointed for a couple of weeks after (the Grand Final). On his time in Australia, Wardle said: “It was an experience and I’m glad I’ve done it. Wardle is expecting to play in the back row at Cas and acknowledges he faces competition for a regular place. He added: “Basically I play back row and when I’m needed at centre I play centre, depending on injuries and things like that. Hopefully I can team up well with the left side they’ve got here and see how it goes. “I think the competition will bring the best out of everybody. There’s four of us at the moment: Alex Foster, me, Mike McMeeken and Oliver Holmes. “We are all good players and we could all play every week. There’s plenty of competition and we have a good laugh about it, which I think’s good.